St. Paul's and Jesuit fared the best at the 2015 Mandeville Open. The Wolves had six champions while the Blue Jays had four. The Holy Cross Tigers netted two championships and Brother Martin and Shaw earned the remainder. 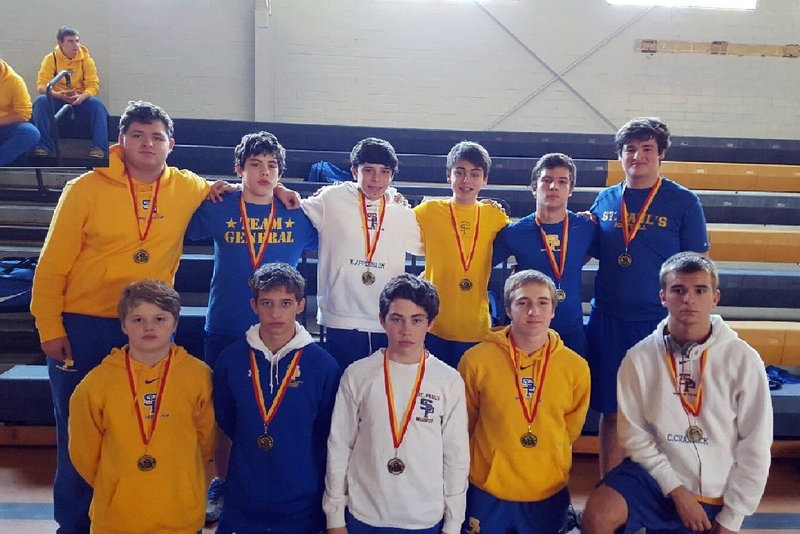 St. Paul's proved they are as legitimate a contender in Division I as Jesuit by placing 10 wrestlers in the top four spots at the Mandeville Open on November 14th. Jesuit wrestlers garnered nine places, followed by Holy Cross with eight. The Wolves' and Blue Jays' performances almost mirrored the results of the dual meet they held on November 5th, won by Jesuit 29-24. As they did at the dual meet, the Wolves won, or in the tournament placed higher, than the Blue Jays in the 160, 195, 285 and 106 pounds weight classes. On the flip side, Jesuit repeated victories or had higher placements than St. Paul's in the 113, 126, 132, 152 and 170 lbs. weight classes. As for the four remaining weight classes, the 138 lbs. edge went to St. Paul's, whereas in the dual meet it went to Jesuit. The reverse happened at 145 lbs. Hence at those weight classes countered each other, and Jesuit was ahead seven weight classes to five. Jesuit took 120 lbs. and St. Paul's got the edge at 182 pounds and 220 lbs. in the tournament, making it a 7-7 tie. In the duals meet Jesuit won eight matches to six for the Wolves. Very little of the above matters (as I am sure the reader is happy to learn) as there were some upsets and no-shows. Eli Larriviere lost his first two matches of the season, losing back-to-back in Sudden Victory rounds. If seeding were used it could be argued that Hunter Bourgeois, were he there, would have faced Jake Rando of Holy Cross in the 145 lbs. final (Bourgeois defeated Jesuit's Nathan Koenig at the dual). Evan Palmisano competed in and won the tournament at 170 lbs., and he defeated the 182 lbs. tournament champion, Josh Mascaro of St. Paul's, in the dual meet. Blake Huff was not at the tournament for the Wolves at 170 lbs., but the edge would still go to Palmisano. Jesuit was lacking Guy Patron, Jr. at 195 lbs. at both events, and Collin Francis of the Wolves was unavailable for the dual meet but won the tournament. Jared Thieler was not on hand for St. Paul's and he defeated tournament champion Jordan Giewat in the dual meet. The conclusion to be made from the above drivel is that both teams are very capable and cannot be overlooked by anyone predicting success in future tournaments, particularly when each has a full squad available. Holy Cross fared third best in the event, but they will have to improve to be considered on a par with Jesuit or St. Paul's. The season is still very young, though, so the Tigers have plenty of time to go with their talent. It was a Tiger, Jake Rando at 145 lbs., who was voted the event's Outstanding Wrestler.